Quadriceps stretches are commonly done prior to any sporting event. We're familiar with the stretch whereby we pull our foot up behind us. A mistake people often make during this stretch is to let their knee drift forward. The part of the quadriceps muscle that is most commonly injured is the rectus femoris - the part that crosses both the hip and the knee joint. See below for the appropriate stretches to target the rectus femoris. What is the quadriceps muscle? The quadriceps make up the bulk of the muscle in the front of the thigh. 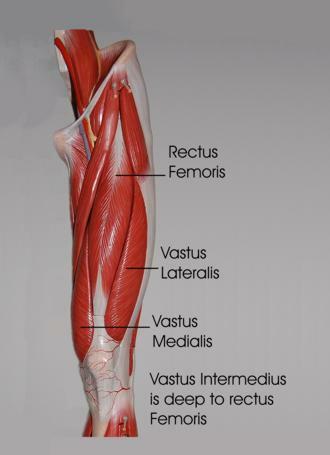 As the name implies there are four parts: rectus femoris, vastus medialis, vastus lateralis, and vastus intermedius. Origin: The rectus femoris is the only part of the quadriceps muscle that crosses the hip, so must be stretched differently. The vastus lateralis, vastus medialis and vastus intermedius originate from the femur. Insertion: The quadriceps inserts into the patella via the quadriceps tendon. Some fibres of vastus medialis insert directly onto the medial aspect of the patella. Action: All four parts of the quadriceps extend the knee. The rectus femoris will also flex the hip. The easiest way to stretch the quadriceps is in standing. Stand beside a chair or counter top so as to hold on with one hand if necessary to balance. Reach down and grab your right ankle. You can use the hand on the same side or the opposite side. Most people find using the opposite hand most comfortable because it allows the hip to stay in a comfortable position. If you are unable to reach your ankle you can loop a belt or towel around your right ankle and pull on that. Straighten your back, lift your chest up and pull your ankle back and up slowly. Kneel onto your right knee and put your left foot in front of you such that your left knee is at 90 degrees. Grab your right foot behind you. Pull your right foot up to your buttocks. Hold this position for the appropriate time. Grab your right ankle behind you. Pull your ankle up behind you. To include the rectus femoris you must also pull your knee back, but be sure you keep your abdominals tight and pelvis neutral. Do not allow your back to arch. Hold this for the appropriate time. Stretching your quadriceps while lying on your stomach prevents the knee from moving forward and negating any stretching effect on the rectus femoris. You can assist this further by putting a small cushion or rolled up towel under your knee. Lie on the table/bed/floor and place a rolled towel under your right knee. Grab your right ankle behind you and pull your ankle up behind. If you are unable to reach your ankle you may use a belt or towel looped around your ankle. Pull your left knee toward your chest as far as you can. Let your right foot off the edge of the bed toward the floor. Allow gravity to pull your right foot toward the floor slowly as you exhale. You can add further stretch by using the hamstrings on your right thigh to pull your right foot further toward the floor. The quadriceps muscle tends to get tight in people involved in running, soccer, hockey - any sport that uses that muscle heavily. Often neglected is the rectus femoris. Like most muscles that cross over two or more joints, it tends to become particularly tight and therefore can disrupt normal joint mechanics, and become prone to strains. In addition, tightness in the vastus lateralis and ITB relative to vastus medialis is a common source of anterior knee pain.